There’s a class for women (18+) of all ages and fitness. It is an alternative way to fitness and strength building. No experience required. All you need is a sense of play and adventure! Term classes run for 10 weeks (NSW school term). To join a class you need to take out an annual membership to Circus WOW. Acquired Taste: This is a choir with a difference. There are no auditions. 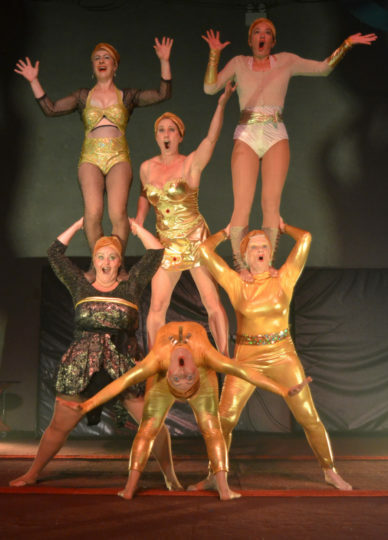 ‘A choired taste’ explores what a choir with a circus edge looks and sounds like. It gathers at Unanderra Hotel on Wednesday evenings to sing and later linger for drinks and/or dinner afterwards. Acrobalance: is the art of adagio, which involves standing and balancing to create beautiful sequences of unique maneuvres in duo and group work. A fun class that develops balance and coordination skill and muscle strength. Aerials: a fun, dynamic and challenging class where you learn trapeze, aerial silks, lyra – try them all and see what you like best. Move on to develop form, technique, movement and acts. Clowning and physical theatre: physical and visual performance and improvisation that potentially can include mime, dance, puppetry and masks. Hula Hoops: learn to twirl your hoop around the waist, limbs or neck, juggle it and do lots of other tricks! Great fun, a good starting point in WOW. Hoopovers: gives more focus on exercise with hoops, aiming to build core and pelvic floor muscles, as well as flexibility, while developing hoop tricks. Introduction to Circus: a taste of many of the above – a great way to start! Object manipulation: juggling, poi, hoops, diablo, flower sticks, spinning plates …. the list is almost endless as to the range of objects you might learn to manipulate. Sometimes the focus is on one, but classes may combine a couple and show where skills cross over. Performance: we write, design our own costumes and perform our own acts that range from storytelling to the satirical and comical. Great if you love to act, make people laugh, voice your social concerns or be court jester. Stilt walking: learn the techniques for this classic circus art and become a fun and vibrant performer roving at events, where your character grant wishes, blow bubbles, spin hoops, dance with feather boas and large wings or just being cheeky. You can develop your character and costume or use existing ones from our wardrobe. You will strengthen a different group of muscles than you are used to. Circus Fundamentals: Learn the basics and increase your strength and mobility for aerial, acro or hoops classes during this 5 week class. Every class will begin with 30 mins of vinyasa yoga and each week will focus on a different skill or apparatus. Great class for those want to try a variety of circus skills with the option to just do the yoga component. There are opportunities for public performances. This is a great way for WOW women to share their fun, skills and progress with fellow class participants, and to family, friends, and a wider audience. Performing is optional.